oday’s tutorial is all about using natural light to create a dreamy photo of a breakfast in bed setup. Lighting is one of the most requested topics on #AskMahaMonday and I don’t think I’ll ever get tired of posting about it! Understanding light is super important and it’s one of the most important skills to master to improve your photography. In this video, I am taking you behind the scenes, sharing each step of the way as I style and shoot this breakfast in bed pancake photo along with my camera settings, if you are ready, let’s dive in! Last week I shared with you how I style and shoot photos with my phone HERE, and you’ve seen me style the halloumi tortilla from start to finish. This week we are talking about an important part of the creative process, which is editing, most photos get edited but we don’t have to sit on our computer and spend hours doing it, when you can do it in 5 mins on your phone for free! Last week I explained to you the three main skills you need to master to step up your Food Photography game and take great pictures with your Phone. If you are anything like me and would love to take better photos with your phone without having to upgrade your gear or the phone that you currently have (unless that’s your excuse to buy a new one, then you have my blessing, haha) then you’ve come to the right place. One of the most popular questions on #AskMahaMonday is about “Lighting”! 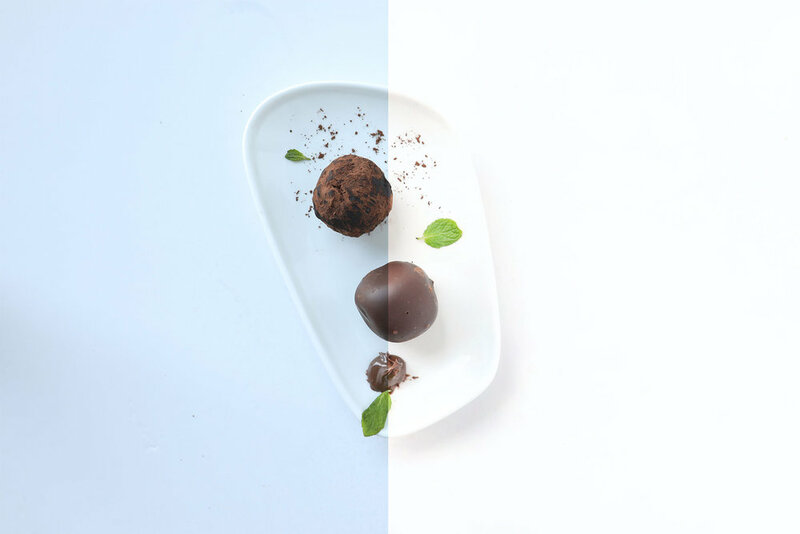 Which admittedly is one of the most important aspects to getting beautiful food photos. Once you understand light quality and direction, you can start to sculpt it and make it work for you, even in low light conditions. #AskMahaMonday: Pro Food Photography on a budget! I’ve been photographing food for about five years now, and although I’ve built my my gear and prop list, I still love and enjoy using the most simple props which you can easily find in any home and most of which you probably already own! 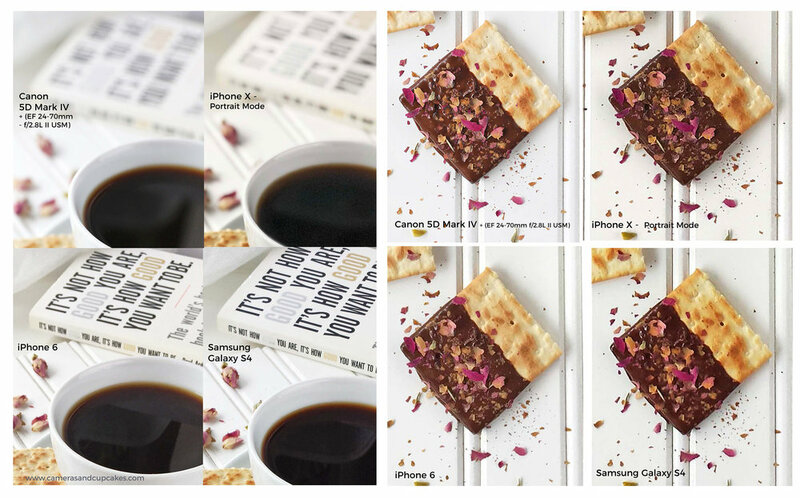 #AskMahaMonday: How to batch-create your content for Instagram and save time! How is it possible that everyone is able to cook a meal, shoot it and share it on Instagram every single day when you can't even decide what you're going to eat for breakfast?! Wouldn't it be great if you didn't have to think or worry about what to post next because you've got it all figured out, because you already have the pictures, the captions and all you need to do is hit post and voila! Today I want to talk about what inspired me to make my very first Avocado rose and since it's #AskMahaMonday I thought I'd share how I photographed it as well! When it comes to Instagram, Flatlays (Top Downs) are the easiest and most common way of shooting, especially if you are using your phone. So in today's post, I am sharing the three rules you can use today to create simply delicious flatlays! #AskMahaMonday turns one and I have a gift for you! Today as a celebration of #AskMahaMonday turning one and in line with my mission, one lucky winner will have the chance to get a "1:1 Online Photography Coaching session with me, where you get feedback on your images & get to ask your most pressing questions"!! Have you ever had trouble setting up, styling and lighting your recipes? Do you ever wonder how professional food photographers do it? Do you have to have a studio to get professional looking photos? In this post, I am taking you behind the scenes of how I styled and photographed this butterscotch pudding, with simple props I found lying around the house and just natural light! #AskMahaMonday: How to make the whites look whiter in one click! Have you ever struggled getting your photos to look pure white? I always get asked how I make my photos bright and make the colours pop! Well, if you manage to get the white to be pure then you are one step closer to getting your colours to look great. One of the biggest struggles for me when I started out with my photography was to make the whites look whiter, somehow shooting white on white always turned out blueish or yellowish depending on the time of the day and quality of light, especially since I shoot with Natural Light almost exclusively! Editing at first used to take too much of my time, and as much as I enjoy the editing process, I always look for ways to save time on editing, this is why when I came across this tool in Photoshop, it was a lifesaver! 1. Spend the next 10 days using this tool with different photos and different scenarios till you master it. When it comes to Food Photography, food is always the hero, but there are unsung heroes that would totally make or break your image, these are also known as "Props". Photo props are the items beside your main subject that add to the story and dimension of the photo. For example, plants, spoons, plates, napkins…etc. Think of them as an accessory complementing the main subject of your photo. To be honest, I am not a techie person, and I don't have a lot interest in camera specifications, what I really care about is whether a camera can help me achieve my creative vision or not. Thirteen years ago I silently wept as I held a DSLR for the first time, I couldn't figure out how to preview the photos I took and was too embarrassed to ask!! Everyone else seemed to know what they were doing and they knew how to take really good pictures, and I felt like I was the only one struggling, the photos I took looked nothing like I thought or hoped they would. Today I am on a mission helping others unleash the Photographer within and create photos they are in love with! When I created #AskMahaMonday almost a year ago, my goal was to help others feel less frustrated and more excited to take out their cameras and start making photos they are proud of! This is why I want to know what do you struggle with the most when it comes to Food and Lifestyle Photography? This is a safe place for you to ask anything, no question is too small or too big, I want to serve you better and create content that is relevant to you. Click here to submit your questions and I'll do my best to get them answered. With over 800 million users on Instagram, it's not very easy to stand out in the crowd, which means, in order to create a follow-worthy Instagram account, your photos need to be really good, I mean more like SUPER good! So today I am sharing my No. 1 composition tip that will take your photos from good to great! Are you ready for this super simple tip? 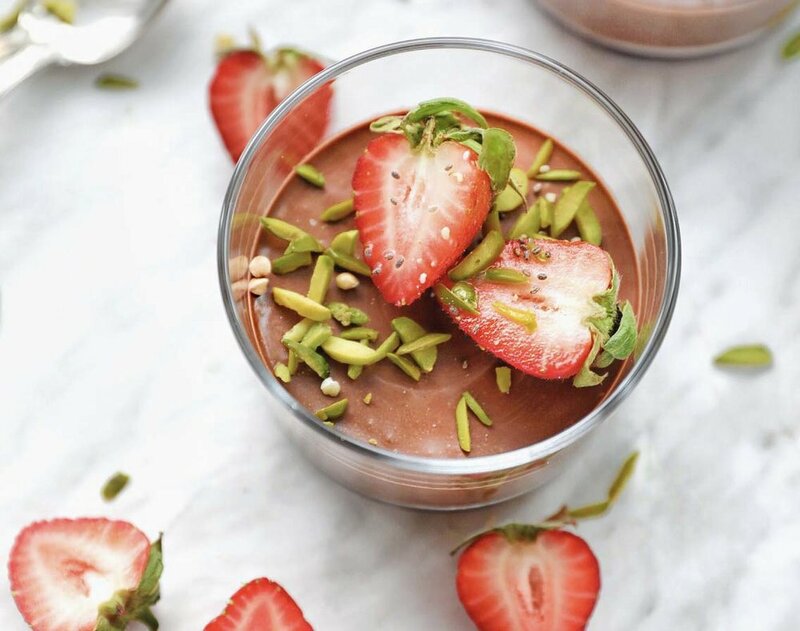 If you've ever tried to photograph and share your recipes, you probably know that getting your food to look delicious, induce hunger and inspire your audience to hop into the kitchen is not as easy as it sounds. Taking the time to style your plate and applying a little charm in the food styling department can go a long way towards a more appetizing photo. 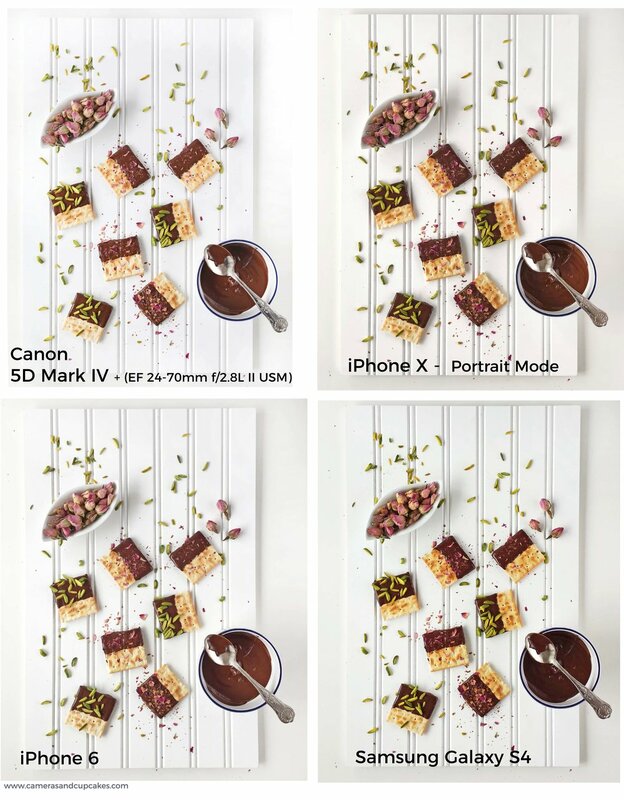 #AskMahaMonday: iPhone X vs. Canon 5D Mark IV - What's the best camera for Food Photography? Which Camera do you use? which lens shall I buy? These possibly are the questions I get asked the most by people who want to start their journey with Food Photography! So today, I decided to do a quick comparison between iPhone X (Apple's new flagship iPhone) and 5D Mark IV (Canon's most versatile DSLR) and just for the fun of it, I've also added images from iPhone 6 and Samsung Galaxy S4. Now that I ran out of phones to compare, I would like to note that this is not a technical post with specs and camera details, this is purely to compare the quality of photos and depth of field when photos are taken with different cameras shot in the same conditions and edited pretty much the same way! All photos were taken with natural light (north facing window) and a reflector. Honestly, with an overhead shot it's pretty hard to notice the difference between these images at first glance! In terms of "Depth of Field", the iPhone X with portrait mode is pretty great at mimicking the 5D Mark IV and achieving a shallow depth of field (Less things in focus), whereas iPhone 6 and Samsung S4 are pretty much the same and can only produce images with a deep depth of field (more things in focus). This is my famous "Chocolate and Banana Pancake Stack" and the photos taken with an iPhone X are pretty impressive when compared to 5D Mark IV. Conclusion: Which is the best camera for Food Photography? In the words of one of my favourite photographers, Chase Jarvis, the best camera is the one on you! 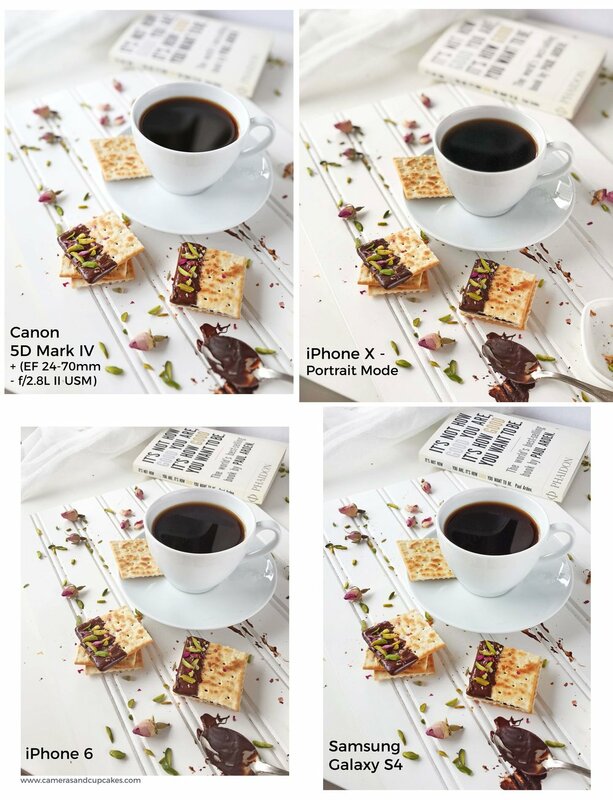 Now don't get me wrong, it's probably unfair to compare Canon's 5D Mark IV with any of these phones because it's definitely going to win in terms of everything, except size and price! The point I am trying to make here is, Photography is about YOU "The Photographer", your vision, skill set and creativity. Great gear will definitely get you closer to where you want to go, but if you can't drive a car, buying a Porsche is not going to make you a better driver. My personal advice is to master light & composition with whichever camera you have before you decide to upgrade. Whether you are starting a career in Food Photography or not. If you want to know how to start your journey in Food Photography, check out my advice here. Now it's your turn, what is your favourite camera when it comes to Food Photography? As always, feel free to hit me up with your questions, and I can't wait for next week and a new episode of #AskMahaMonday!